Today is the first day of the Anise Sew-along. Ready to shop? If you’re following along with the Anise Companion, we’ll be covering the material from day 1, pages 4-9. If you’re reading the companion, this information might be repetitive, but this way we can review it together. These are the supplies you’ll need for our sew-along. Main fabric. This is likely to be wool, but you can also other fabrics, including linen or even cotton for a light summer jacket. Wool will be easiest to work with because it responds so well to pressing. My favorite choices for this jacket are wool flannel, worsted, boucle, tweed, or camel hair. But there is a big range of appropriate fabrics. Just consider their weight and drape individually. You want something stiff enough to be tailored and scultped, but not so heavy that you end up with a lot of bulk. For my jacket, I’ll be using a light blue textured Pendleton wool I got on mega-sale. Fusible weft interfacing. Look for weft interfacing, which will drape well for this jacket. You can find it in black as well as white. Choose a weight that will work well with your fabric, giving the right amount of stiffness. You can experiment with woven interfacings, but do not use nonwoven. Lining fabric. This is the fabric for the inside of your jacket. Choose a fabric to match, or opt for a fun color or print. I recommend all kinds of silk (twill, crepe, or charmeuse are lovely) or a rayon lining fabric. Skip the polyester or acetate, which get hot and sweaty. I’ll be using a vintage grey polka dot silk. Underlining fabric. Choose plain cotton muslin to underline your jacket, giving it more body. Hold the muslin together with your fabric and interfacing to choose one with the right amount of stiffness. Test garment fabric. Buy extra muslin so you can make a test garment and fit it before sewing. If you have some inexpensive fabric lying around that more closely matches your main fabric, you could also use that. Eight 1” buttons. Pick out some 1 inch buttons. They could contrast with your jacket fabric, or coordinate with it. Pinking shears (optional). We’ll use these to finish the edges of our pockets later. Now it’s time to preshrink your fabric. That means getting all the shrinkage out BEFORE your garment is sewn. Even if you’ll be dry cleaning a wool jacket, you need to eliminate the shrink that will happen eventually. Wool is very prone to shrinkage. For other fabrics, such as your lining fabric, simply wash them as you normally would. For silks and rayons, I prefer to hand wash in warm water, then hang dry. Once it’s dry, press with steam to remove any wrinkles. Preshrink the muslin you’ll be using to underline your jacket, but don’t worry about the muslin you’re using for your test garment. Since that’s only a temporary garment that you won’t be wearing, there’s no need to preshrink. Want to get a head start on day 2? You can start cutting and stitching up your test muslin. We’ll talk fitting in one week, so you have plenty of time to get your stuff together. Join us next Tuesday, Oct 2 with all your supplies and we’ll get started with fitting! How about a light/medium weight denim for the shell? I think denim would be awesome. I was thinking the same thing! I would love to sew with wool, but live in Florida and rarely wear wool jackets. That sounds good to me! Just be sure to do a one way layout for the corduroy. I’m thinking of underlining the whole coat with a light weight polyester wadding so that it would become warm enough to be my winter coat. I’m on edge about this, because my main fabric is medium/heavy weught wool and I don’t want to make the coat too stiff. What about flannel or lambswool? Flannel sounds like a good option. I’m not sure I could find suitable lambswool anywhere in here, but I’m much more optimistic when it comes to flannel. I was thinking of medium denim for the shell since I also live in Florida. It will have the lining so I think that should be warm enough for a cool day :). Denim should work with this pattern, right? Hope so! Corduroy is genius!!!!! I also love the idea of over-dyed denim. I don’t wear wear and don’t know too much about heavier apparel fabric, so these ideas intrigue me! I too was thinking of using corduroy but was not sure if it can work. I’m excited to make up this jacket! I have a quick question – I am positive I’ll need to do an FBA. Would you recommend cutting the pattern according to high bust measurement in that case? I’d cut by full bust. Then you can follow the full bust instructions from the companion, if you have it. Thanks so much! I don’t have the companion, but I’ll definitely download it! I could not find weft interfacing and when I asked at JoAnn’s they looked at me like I had two heads, so frustrating. Is there a particular brand ? Can I use regular woven interfacing? What weight should it be? I’m going shopping for fabric tomorrow and am so excited! Can we set up a Flickr group for the sewalong so we can all chat with eachother and share our fabric choices, etc? Great idea. I wasn’t sure whether we should use Flickr or the forum, but I’ll set up a Flickr group later today and mention it on the blog. I, too, am concerned about finding weft interfacing. I had to drive an hour-ish to get my main fabric and lining. Not sure why on earth I didn’t just get the weft there as well. I think I figured Joann’s would have it. No such luck. Anyone have any ideas or brands I could search for? I haven’t made a jacket in nearly 30 years! I’m fairly intimidated, but also extremely excited about this project. I’m thinking about using…this…but it’s coating (labeled light/medium weight). Eep! I’m a little hesitant. Haaaaaah, well, that was a really cool link to a hamster powered submarine that was on my clipboard…….. THIS is my ideal fabric. That fabric is fabulous. I think you’ll know more when you get it. I find that the fabric naming at Denver fabrics is not always rigorous. But if it’s labeled light/medium, it’ll probably work out! I did find weft interfacing at my local Joanns (which isn’t very big). It’s called Pellon 860-F Ultra-Weft. I didn’t know if it was right but I bought it anyway! I am going to be sewing mine up in corduroy, as well. (Got the idea from the Donna Reed show!) I haven’t done much sewing before, and never with one-way fabrics, so I was wondering, how much yardage should I buy for the shell with the half-sleeves? I’d recommend laying the pieces out ahead of time and seeing how much yardage it will take. You’ll be able to economize more that way and probably save fabric. I bought my fabrics today and am now even more excited to get started! I didn’t buy the underlining muslin though because I’m not sure I understand the “hold the fabrics together to find the right stiffness” instructions. I guess my question really is: Should the muslin be a heavier weight than quilting-weight muslin? You need to match the weights to get the weight that feels right to you. I used a light-to-medium weight muslin, which I think works well for many medium weight fabrics. But this is somewhat at your own discretion. Yes, those are the ones I used and they were great! If anyone else has a similar issue, you can also layer batting together to form your own shoulder pads. That’s basically all the 3-ply shoulder pads are. You can do this. 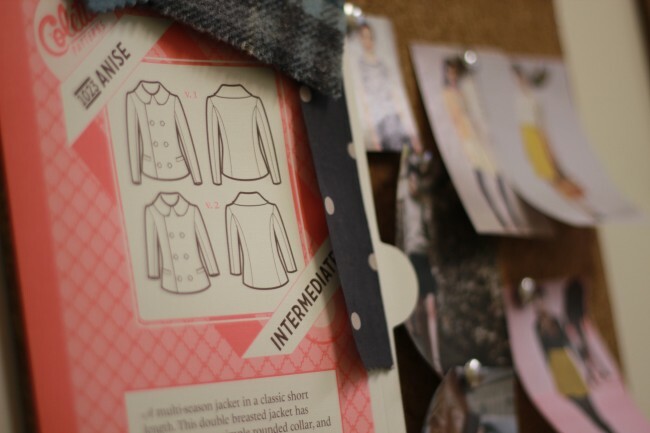 You will want to place the buttons along the center front of the jacket (the line on the pattern piece). The edge of the jacket should extend past this, plus have a seam allowance. I’m so excited for this sew-along! I ordered some seafoam wool flannel and treated myself to some silk charmeuse for the lining. :-) Can’t wait to get started on the muslin! quick question about prepping fabric – is there any kind of prewash or pre-treatment needed for the shoulder pads and sleeveheads? Would this interlining be suitable for the jacket – I’m in Scotland and need my jacket to be dead cosy. The shell will be a nice harris tweed, and I hope to give it a good interlining so it’ll see me through the winters. I was curious about your samples for the Anise. You mention the light blue pendleton wool above. But what type of fabric was the pink and darker blue samples made in? They’re both wool coatings. The pink is a little heavier, more of a melton wool. The navy may have been Pendleton too, if I remember correctly. But it has a smooth surface, unlike the more textured light blue wool.